CNC routers use specialized door making router bits for jointing, rabbeting, grooving and copying of raw material, melamine and laminates, MDF, HPL and veneered panels. Holbren has the router bits for doors you need for these jobs. They are made with super strength steel and have a cutter that can be resharpened (max 3 times). Other features include DP cutting edge, an HW plunging tip for diagonal plunge-cutting (Z-axis tool entrance) and a maximum feed speed of 5 m/min. Take a moment and view the bit list below to find the right Whiteside Diamond Compression Router Bits for your work. 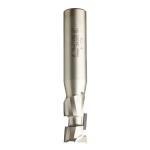 CMT Diamond Compression Straight Bit 1/2" x 1-1/16"
CMT Diamond Compression Straight Bit 1/2" x 1-13/32"
CMT Diamond Compression Straight Bit 5/8" x 1-1/16"
CMT Diamond Compression Straight Bit 5/8" x 1-49/64"
CMT Diamond Compression Straight Bit 3/4" x 1-1/16"
CMT Diamond Compression Straight Bit 3/4" x 1-49/64"